How can we facilitate conversations around health and make them more meaningful for patients and their supporters? 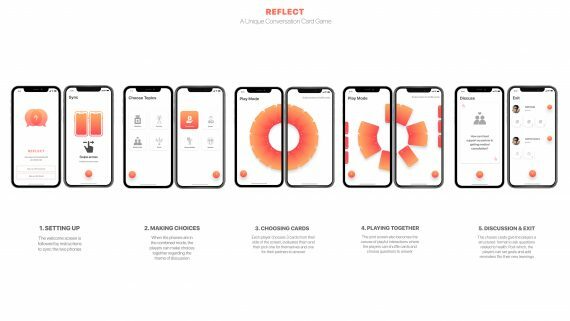 Reflect is a game-like conversation app that provides a playful platform for patients and their supporters to engage in meaningful conversations around health. It provides them a template to ask sensitive but important questions to make better health decisions. It also helps them set up goals and co-work as a team in overcoming their challenges. The game can only be played when the two phones are brought together creating a combined screen. The key interaction recreates the charm of a board game and encourages dialogue through in-person interaction. The app is designed to be a medium to encourage meaningful conversations between patients and supporters in a delightful way. The interface is unique which allows the players to combine the display of their phones with a swipe of a finger. The players can then choose the conversation themes from the various topics related to health. Post which the app generates a mix of cards that can be shuffled by the players on the combined screen. They pick one card for themselves and one for their partner to engage in meaningful conversations. Post discussion, the app gives the players the opportunity to take notes, set goals or reminders from the new learnings that they gathered from the game. We did extensive desk research and conducted in depth user interviews with eight patients and their supporters to closely understand their challenges and motivations. These structured qualitative interviews helped us see common patterns in their experiences and better understand their obstacles. All our observations from the interviews were later grouped under common themes to identify patterns and see the bigger picture. This became our raw material in finding insights which further led us to frame design principles. Group brainstorming helped us to convert the design principles into opportunities for intervention. We further came up with a pool of concepts to address the problems. And in the end we decided to continue in a direction that focussed on the emotional support that patients got from their loved ones. This not only gave them the courage to fight any obstacle, but also empowered them to face the difficult situation boldly as a team.